We are pleased to announce that Plymouth's second Times Tables Rock Wrangle will be taking place in July! 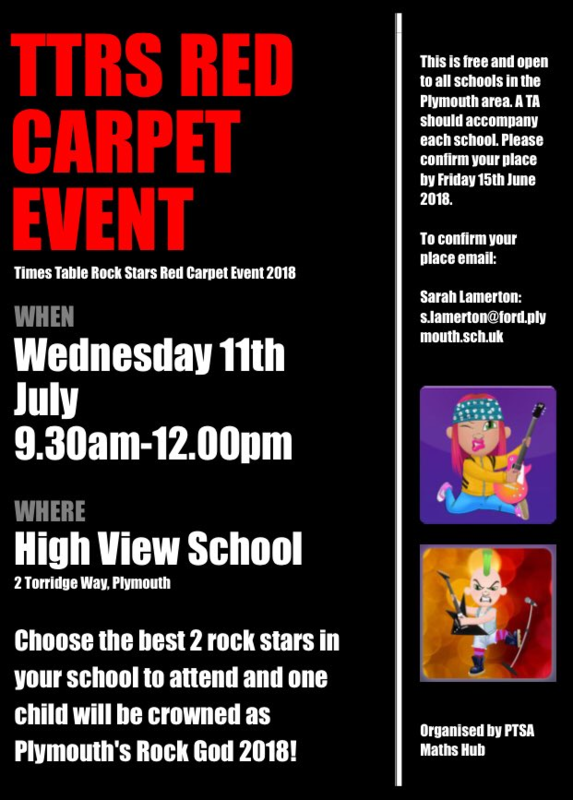 Students will compete in a series of heats and head-to-head times-tables-offs, to find out who will be the Supreme Ultimate Rock Hero for Eternity. The event will be hosted by High View School on Wednesday 11th of July. The competition is open to 30 teams of 2 students, from schools currently subscribed to Times Tables Rock Stars, or those trialling a subscription at the time of the event. Teams should be made up of three students and accompanied by a teacher. Entry is free and open to all schools in the Plymouth area. A TA should accompany each school. Please confirm your place by Friday 15th of June.